Jason O. Watson/US Presswire The Sharks' playoff run could lead them to the Stanley Cup finals. The San Jose Sharks avoided the ugly section of the history book by scoring a hard-fought, 3-2 win over the Detroit Red Wings Thursday night in San Jose. With the victory, they advance to face the Vancouver Canucks in the Western Conference finals. In storybook fashion, Sharks winger Patrick Marleau netted the game winner, tapping a loose puck into a yawning net behind Wings goalie Jimmy Howard. A few days earlier, you might remember, Versus analyst/former Sharks player Jeremy Roenick had called Marleau "gutless" after a Game 5 loss. Roenick later backtracked a bit, saying he used the wrong word. Still, his commentary brightened the spotlight on Marleau's early-series struggles. In Game 7, Marleau found his way, not only scoring the game winner but registering five shots, two hits, two blocked shots and a takeaway in his 20 minutes, 36 seconds. In the final seconds, Marleau made a strong defensive play in front of the net and he eventually cleared the puck down the ice as time expired. Marleau wasn't the only Sharks player to step up his effort in the decisive game. Goalie Antti Niemi turned in another strong performance, turning back 38 of 40 shots to secure the win. He turned aside a last-minute drive off the magical stick of Pavel Datsyuk, who earlier found the top corner with a quick backhand. Datsyuk's slapper nearly handcuffed Niemi, who managed to glove down the well-placed blast. 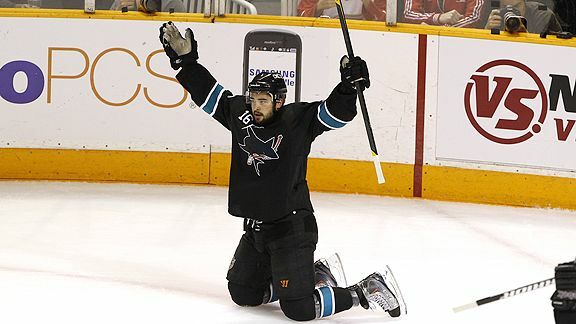 I thought Dan Boyle was another huge factor for San Jose -- perhaps the biggest factor. Playing a game-high 27 minutes, 4 seconds, he assisted on a pair of goals, including the game winner. Boyle started the decisive scoring play by making a brilliant pass to Devin Setoguchi, who took the shot that leaked through Howard into the crease, where Marleau finished the job. A Stanley Cup winner with the Lightning in 2004, Boyle was also credited with three hits and two blocked shots. I'm pretty certain that Sharks coach Todd McLellan would have liked to leave Boyle on the ice for the entire game. When he was on the bench, the Sharks were usually backed up in their end. Boyle is a difference-maker every single night. Finally, Joe Thornton was all in throughout the evening. I was most impressed with his hard work on the backcheck. Thornton really busted a gut to get back to help prevent a shorthanded goal midway through the second period. And of course, he made a terrific pass to set up Setoguchi's power-play goal in the first period. After dealing with Datsyuk for seven games, Thornton now gets to focus on Vancouver's Ryan Kesler. That figures to be a battle of a more physical kind. I think Niemi will have to continue his strong play to get San Jose to the final round. With a Stanley Cup and a perfect 6-0 playoff series record on his resume, the quiet Finnish-born stopper has proven he can get the job done. The Canucks definitely know what he can do, as Niemi helped Chicago eliminate Vancouver last spring. I suspect this will be another tough series. In fact, I wouldn't be surprised to see it go the distance. I'll take the Sharks to find a way to advance to their first Cup final. And when they get there, I think they'll see the Lightning. I give them an edge over the Bruins, mainly because of Patrice Bergeron's concussion issues. I just think it will be really hard for B's coach Claude Julien to replace all the things that Bergeron does for the team. If he can return healthy during the season, he can be a difference-maker. That's a pretty big "if." While I'm not certain about either pick, I am sure that this will be the last entry to my ESPN Insider blog. After 13 years in the ESPN family, I'm leaving to pursue a new opportunity with the NHL Network and NHL.com. Among the hundreds of terrific professionals that I've had the great fortune to work with during my tenure at ESPN, I'd like to thank my Insider editors Dan Kaufman and Mike Hume. These two guys have made my life a lot easier over the past few years. It has been an absolute pleasure to work with both of them. And, I'd be remiss if I didn't thank you, the reader, for taking the time to check out this space over the past few hockey seasons. I know we didn't always agree, but we share the same passion for this great game. For now, I hope you enjoy the rest of the playoffs, and you can always look for me at the rink. E.J. Hradek is a senior writer at ESPN The Magazine, joining the staff prior to its launch in 1998. He began covering hockey as a writer/editor for Hockey Illustrated in 1989. The following year, he beat the Stars to Dallas (by three years), taking over as the editor of Beckett Hockey Monthly. When the Stars finally did arrive in Big D, he hosted a weekly hockey radio show and tried (unsuccessfully) to convert ESPN's Skip Bayless to the greatest game on ice. In 1996, Hradek left Dallas, but not the Stars. Relocating back to the New York area, he became a part-time pro scout for the club, seeing more than 100 NHL/AHL games for each of the next two seasons. The scouting gig was a great learning experience, offering a different view of the game. Hradek grew up in Tuckahoe, N.Y., about a 40-minute train ride from New York City. Despite the proximity to the Rangers, Hradek embraced the Islanders when the expansion franchise debuted in 1972. Eight years later, he was part of the sellout crowd at the Nassau Coliseum that witnessed the Islanders' first Stanley Cup championship.